Today I received another package from my secret pal, yes the second one this month!!! It is fabulous, she set me up for a movie night with Jeunet. 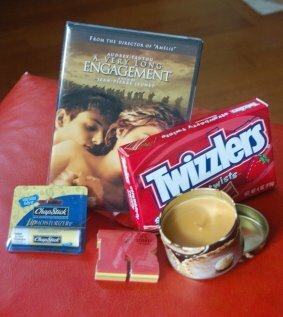 She sent a dvd copy of a Very Long Engagement, a box of twizzlers, a pumpkin candle (yummy) , some yummy lip balm, and some sticky notes that I have already made good use of. She also made me a knitted hat with a ghost (not pictured) that I wore all morning. Then, if that wasn't enough, she also sent a Halloween card. The card contained my first SP clue, she is a Georgian. I am still puzzled to your identity, but I love the gifts!!! BTW- I have been knitting like crazy lately, but I still need to take pictures of some of my FO's. I am hoping that tomorrow will be the day.